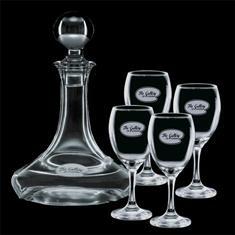 An impressive 24% Lead Crystal Ship's Decanter with 4 Wine Glasses makes a stunning Business Gift. Crystal is an elegant gift whose value is universally recognized. Packed in a gift box for presentation. Truly a remarkable gift for those special clients.